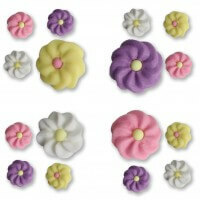 Our sugar flowers in packs of 1,000 each are sorted into 4 different designs. In addition to white flowers you get yellow, pink and purple flowers. Our mini daisies made of sugar are perfect for quickly and effortlessly beautifying, especially large quantities of pastries. Due to the easy handling, our decoration made of the finest sugar mass is also suitable for both grown and young children. They enjoy the variety of decorative elements.